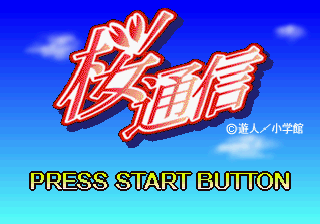 Sakura Tsuushin (桜通信) is an adventure game for the Sega Saturn that is based on a manga/anime of the same name. Many of the game's cut scenes come straight from it's anime. The game follows series main character Touma Inaba as he tries to get into Keio University while dealing with romance and relationships. Main article: Sakura Tsuushin/Magazine articles.